Note from Jeff Strauss: I LOVE this stuff! It really is the amazing ketchup/salsa replacement that Neela imagined when she invented it. 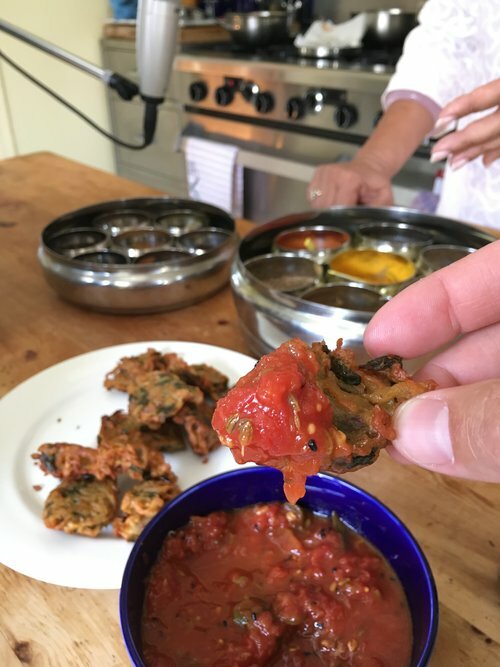 I make it on the stovetop, with a medium-sized, heavy gauge saucepan set on medium low heat to cook the chutney down and thicken it, but this recipe, adapted from Neela’s “The New Indian Slow Cooker” uses, what-else?... the slow-cooker! 1) Turn the slow-cooker on to the high setting for 15 minutes, while you prepare the rest of the ingredients, until the insert is warmed through. 2) Drain the tomatoes in a strainer for a few minutes, then coarsely chop them in a food processor. 3) Being careful to remove or hold the blade in place (ask Strauss’s thumb) Add the chopped tomatoes, sugar, and jaggery to the slow-cooker. 4) In a small saucepan, heat the oil over high heat. (Keep a well-fitting lid nearby). Tilt the pan slightly away from you to form a pool and carefully add the panch puran, kari leaves, and chilis to the oil; cover immediately to avoid splattering. 5) Listen. As soon as they stop sputtering, transfer the oil and the spices to the tomato mixture in the slow cooker. Stir well, cover, and reduce to low heat and cook for 2 hours. 6) When the chutney has reduced and thickened slightly and the flavors have combined well, transfer it all to a mixing bowl to cool to room temperature. When cooled, stir in the vinegar and refrigerate until ready to serve. Note: this recipe is too low-acid to be stored for a long time but will keep for a week to ten days if stored in a sterilized jar in the refrigerator. If you’re concerned about food safety, bring the chutney to a gentle boil and let it re-cool to room temperature after it’s been stored for a while.